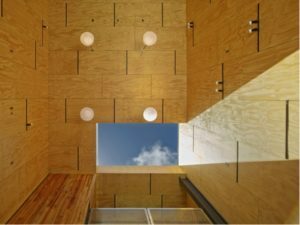 2016 Kirby Ward Fitzpatrick Award presented to Interstice Architects. 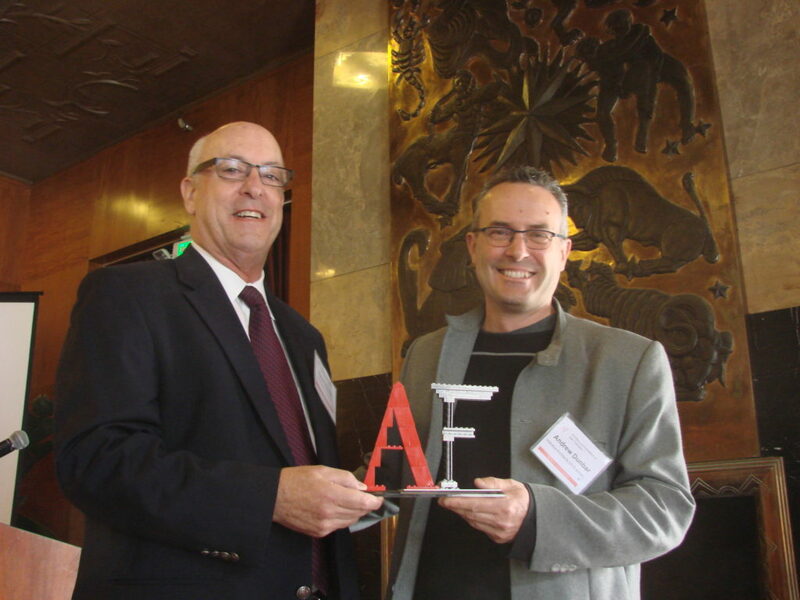 The Architectural Foundation of San Francisco presents the Kirby Ward Fitzpatrick Prize every year to a small San Francisco architectural firm honoring design excellence. This year the prize has been awarded to Interstice Architects of San Francisco, for DREAM:shop. 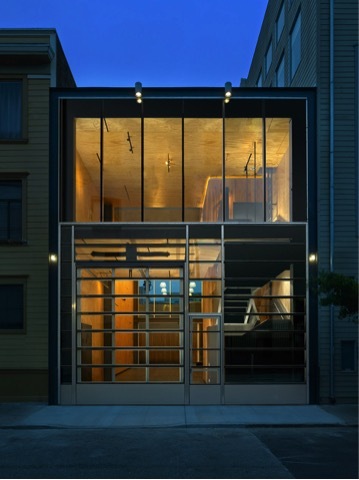 The prize is given in honor of San Francisco architect Kirby Ward Fitzpatrick (1935 – 1988). Kirby’s work included the Peralta Elementary School in Oakland with Dan Solomon, which was published in Progressive Architecture. During the time his studio was at 447 Sutter Street, he also designed many private homes, including one in St. Helena which was published in Architectural Record. This project is as a minimalist “open-ended” event space for an avid maker-client and his creative partners to experiment and ideate. 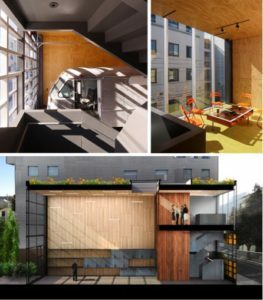 Located in the central Mission, this simple plywood lined tube serves as a hybrid space for office, event space, laboratory and workshop all organized around a single three level vertical service core of reclaimed myrtle Wood. The unencumbered volume integrates circulation, aperture, glazing and high performance systems to prioritize flexibility and future change. 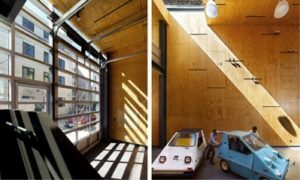 The original Auto repair garage building was mostly demolished to allow the new generously “open” (both formally and programmatically) tube-like volume to connect the street to a private outdoor rear-yard workspace at the rear of the site. Maximizing glazing on both ends allowed for natural light and passive cross ventilation, including a fully retractable skylight at its core where one can access the native meadow roof garden. This core vertically consolidates all the functions of mechanical room, wet-lab, kitchen and bathrooms within a three level column. 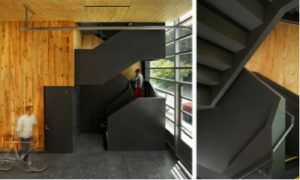 Accessed by a sculptural twisting stair, the service “column” allows the mezzanine office to be isolated from the workshop volume with glass curtains at two strategic locations. 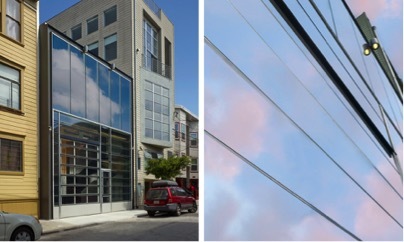 The smooth glass Street Façade de-materializes the dense urban fabric in which it is inserted, creating a shimmering void reflecting the sky by day and a glowing interior by night, while seamlessly integrating both vehicular and pedestrian access from Minna Street. 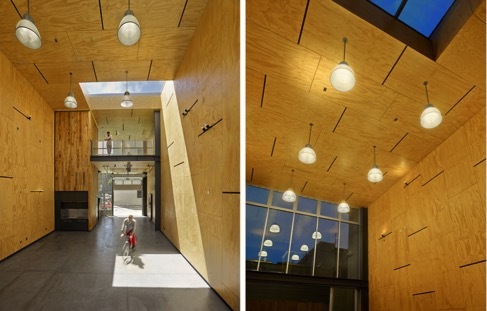 Walls and ceilings are laid out in a rational full sheet plywood pattern to minimize waste. Light tracks are introduced into the joints in a randomized pattern to allow flexibility of future program possibilities and a myriad of light types, from orient-able spots, floods, pendants and line voltage theatrical spots, to plug-in projectors and accessories. Six oversized dimmable high intensity industrial fluorescent fixtures float like balloons in the prismatic void – an unencumbered volume which integrates circulation, aperture, glazing and high performance systems to prioritize flexibility and future change all within a clearly defined space that breathes natural light in constant dialogue with the suns and the ever changing seasons.